Indonesia straddles the Asian and Australian continental plates which generates abundant diversity among plant and animal life. This location also creates a stunning contrast of topographies and ecologies from east to west. You will find mist-shrouded volcanoes, glacier-topped mountains, unexplored rainforests, thousands of miles of beaches and endless coral reefs. This diverse land also supports an abundance of wildlife, which makes Indonesia a rewarding destination for photographers. Indonesia has just one percent of the world’s land area, but this country is home to more than 10 percent of all mammal species and 17 percent of all birds. Indonesia has more known mammal species than any other country in the world. It also has more endangered mammals than any other country, including the endangered orangutan, Javan rhinoceros, Komodo dragon, Sumatran tiger, and Sumatran elephant. Indonesia is home to leopards, king cobras, hornbills, proboscis monkeys, sun bears, wild boars, and hundreds of other rare and fascinating creatures. Scientists are still discovering several new species each year, especially on Borneo and in the highlands of Papua. In the middle of the 19th Century, British zoologist Alfred Russel Wallace observed that the animals east of Bali and Borneo were closely associated with the species found in Australia. Meanwhile, the animals on the islands to the west of Lombok and Sulawesi had more in common with creatures from the Indo-Malayan region of Southeast Asia. This invisible border has since been named the Wallace Line. In Papua, for example, there are major areas of dense forest and swamp similar to those of Sumatra and Kalimantan, but the large mammals of Asia, such as the tiger, rhinoceros and elephant, are absent. Instead, many Australian-derived species are found on this side of the Wallace Line, including wallabies, carnivorous mice, bandicoots, and flying possums such as the sugar glider, which uses the membrane stretched between its legs to help it float from tree to tree. This region also features tree kangaroos, which are at home among the branches, but find walking difficult. The spiny anteater also is found here. This creature is related to the duck-billed platypus. Indonesia is home to the second‑largest rainforest in the world—second only to Brazil—with about 350 million acres. These forests contain an estimated 4,000 species of trees, 30,000 flowering plant species, 500 species of mammals, more than 1,500 species of birds, and 5,000 varieties of orchids. The flora of Indonesia ranges from the tiny orchid to the giant rafflesia plant—the largest flower in the world (up to three feet across). Many of these plants and animals are only found on these islands. Plants are integral to local life across Indonesia’s many islands. Local people use approximately 6,000 species of plants for traditional herbal medicines and for important rituals and ceremonies. Indonesia’s agricultural products include rubber, coconut, coffee, tea, cocoa, corn, spices, palm oil, tobacco, rice, and an abundance of vegetables and fruit, including more than 100 types of bananas. The country has some of the richest timber resources in the world and the largest concentration of tropical hardwoods, including teak, pinewood, rattan, and bamboo. The large mammals of western Indonesia arrived from the north when the islands were covered with dense jungle. They remain only where lowland forest is still intact. The greatest threat to their existence, other than poaching, is the clearing of forest for agriculture and intensive logging. The Asian elephant is the largest mammal on earth. In Indonesia, it roams the wilds of Sumatra and Kalimantan. The largest populations are concentrated in Way Kambas National Park and the Air Sugihan Reserve in South Sumatra. An adult Asian elephant consumes about 300 pounds of food per day. They love the succulent leaves of young bamboo, ginger, and wild bananas. They also love oil palm, coconut, and other cultivated crops. A herd of these hungry creatures can wipe out young plantations quickly, which pits the elephants against their human neighbors in battles for survival. When elephants are pressed for space, they can come out of the jungle fighting mad, destroying crops, homes, and even killing farmers and their families. Many elephants also have been killed in this ongoing turf battle. To help minimize and manage these conflicts, the forestry department started an elephant education center at Way Kambas National Park. The center has trained hundreds of elephants to listen to human commands. Then the trained elephants are returned to the wild herds. When the herds come too close to a village or a plantation, villagers can issue commands to the trained animal to take the entire herd away from human conflict. Hundreds of villagers also have learned how to manage the wild animals in this manner. The education center has spawned similar training centers on Sumatra. 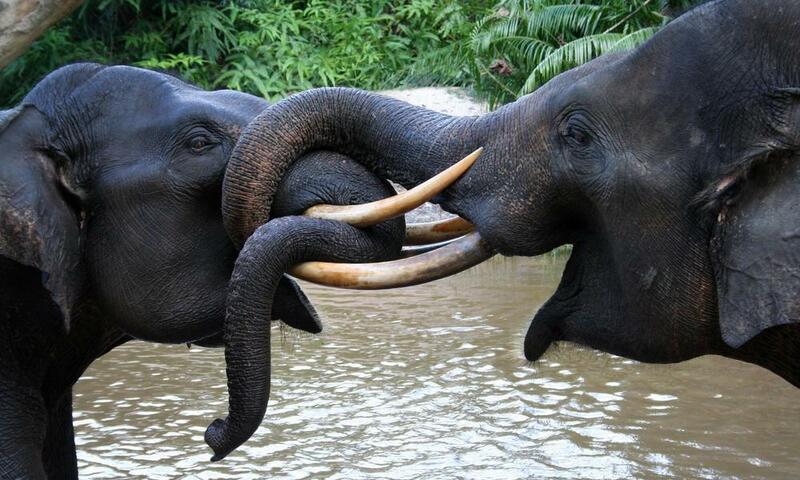 As a result, elephant populations in parts of Sumatra are stabilizing. The fate of the elephant in Indonesia rests with its ability to coexist with its human neighbors. Programs such as the elephant education center can promote coexistence. Most visitors to Indonesia hope to see the Sumatran tiger. However, this beautiful animal rarely shows itself. Unfortunately, human development has already pushed two other tiger species in Indonesia into extinction. The Javan tiger was declared extinct in 1994 and the Balinese tiger was last seen several decades before that. Fewer than 500 Sumatran tigers are left in the wild and the number is dropping steadily. If habitat destruction and poaching across Asia are not stopped, wild tigers have just a few years to survive. Tiger bones and body parts are sold on the black market for use in traditional Chinese medicines. This demand alone is putting tremendous pressure on these beautiful animals. Meanwhile, the forests where they live are being destroyed for timber, mining, and farming. Each animal needs up to 20 square miles to survive and forests are a vanishing resource in many regions. The orangutan is another favorite attraction among wildlife enthusiasts. In Indonesia, its name means man of the forest. The orangutan is the only great ape found in Asia and it is highly endangered because of habitat destruction and illegal poaching. Orangutans live in the wet and hot forests of Sumatra and Kalimantan (Borneo). The orangutan is one of the most impressive and famous apes in the world. The orangutan is the largest tree-dwelling animal on the planet and the second-largest great ape behind the gorilla. A full grown male is as large as a man, but several times stronger. The mature male has large, fleshy cheek pads and a heavy throat pouch. It can weigh more than 250 pounds. The full-grown female is about half that weight. Adult orangutans have an intelligence level similar to that of a five-year-old child. They move through the forest high in the canopy, swinging from tree to tree. Orangutans range over large areas in pursuit of food, including fruit, bark, leaves, flowers, and insects. They live a nomadic lifestyle that depends on food availability. The males frequently come down to the ground to travel longer distances, while the females rarely leave the trees. They have a solitary lifestyle, unlike other species of monkeys or apes. However, mothers will intentionally bring their young together to play. They make new beds high in the trees every day because they refuse to use the same bed more than once. Females are not sexually active until they are about 15 years old. They usually reproduce about once every seven years, because the mothers care for their babies for about five years. Females rarely give birth more than three times in their life, which is the longest birth interval of any mammal. This fact doesn’t bode well for a species under siege. Orangutans also are the victims of an illegal pet trade. Illegal poachers take the baby orangutans after killing their mothers. They sell the babies as pets in places such as Taipei. Indonesian law has protected orangutans since 1925, but enforcing the law and confiscating orangutans from people is a complicated process. In the past, when a government official found someone possessing an orangutan, the animal either had to be released immediately or put to sleep. Since the government rarely had the facilities or the training to properly prepare the animals for release into the wild, and since no one wanted to destroy the animals, few orangutans were confiscated. Thanks to the development of orangutan rehabilitation centers, such as Camp Leakey, Wanariset Station, and others, captured orangutans now have a better chance to return to the wild. Unfortunately, reintroduction is very challenging and does not always work. Habitat destruction is the greatest threat to the survival of the orangutan. It depends on the rainforest to survive. More than half of the world’s tropical rainforests have been destroyed in the last 30 years and some estimate that 80 percent of the orangutan’s habitat has been destroyed in just the last 20 years. Illegal logging, slash-and-burn agriculture, gold mining, and forest fires threaten their survival. Only about five percent of the surviving orangutans live in protected areas, such as nature reserves and national parks, which means this species might be gone from the wild in 10 years. The current number of wild orangutans is estimated at fewer than 60,000 animals on both Sumatra and Borneo combined. There were twice as many just 10 years ago. Indonesia has many smaller primates, including various species of gibbon—human’s closest relative. See the shy proboscis monkey, with its long nose. Leaf monkeys are often seen swinging from tree to tree, and numerous species of macaques are common on several islands. The smallest of Indonesia’s primates is the nocturnal tarsier. The spectral tarsier is a tiny creature with a body only four inches long and a tail that is twice as long as its body. There are only about 3,000 – 5,000 Komodo dragons alive in the wild and they are limited to a few volcanic islands in Indonesia. The island of Komodo is now a nature reserve where the dragon is protected. The dragon is a large and deadly monitor lizard with close ancestors that date back more than 100 million years. It is the largest living lizard in the world (averaging 10 feet long and 200 pounds), but not the largest reptile (alligators and crocodiles can grow larger). It is highly advisable to keep them at a safe distance and always look for them when touring their domain. More than a dozen human deaths have been attributed to dragon bites over the last century. A Swiss tourist sat down to relax while the rest of his tour group went onward. He was attacked and eaten by a dragon. All that was left was a piece of his camera. The discovery of the Komodo dragon is one of the zoological surprises of the 20th Century. Large lizards were assumed extinct until 1912, when a party of pearl fishermen went to Komodo Island and brought back stories of an enormous, prehistoric creature. An expedition followed from the Buitenzorg Zoological Museum on Java. A report about the dragons was published, but received little attention in the years leading up to World War I. In 1926, an expedition from the American Museum of Natural History traveled to Komodo to investigate the dragons. The expedition confirmed the stories and they returned with some specimens that they killed on their adventure. Komodo dragons are the world’s heaviest lizards. They can grow to a length of about 10 feet, with an average weight of 200 pounds. Females are usually less than eight feet long and weigh about 150 pounds. Their teeth resemble those of flesh-eating sharks. Dragon’s have about 60 short, sharp teeth designed to cut and tear flesh. A dragon will go through four or five sets of teeth in a lifetime. Its tooth serrations hold bits of meat from each meal, which supports large numbers of bacteria. Scientists have found about 50 different bacterial strains in the saliva, at least seven of which are highly septic. If its prey survives the original attack, it will die within a few days from an infection caused by the dragon’s toxic saliva. Young dragons live in trees and eat insects, birds, eggs, small mammals and other reptiles. They will cautiously descend from the trees to consume meat left by their bigger relatives. Dragons have keen senses and are considered among the most intelligent living reptiles. They can run briefly at speeds up to 15 kilometers per hour and they can see objects as far away as 300 meters. They have a much more limited hearing range than humans, which means they cannot hear low-pitched voices or high-pitched screams. The Komodo dragon’s sense of smell is its primary food detector. If aided by wind, it can sense food up to five miles away. It detects odors with its long, forked tongue, which constantly slithers in and out to monitor odors in the air. When the dragon hunts larger prey, it attacks the feet first, knocking the animal off balance. If the deer, for instance, fails to escape immediately, the dragon will rip it apart immediately. Komodo dragons are at the top of the food chain in their habitat and they can take down a water buffalo. Both their jaws and stomachs are expandable, which allows dragons to consume as much as 80 percent of their body weight at one time. Despite their size, the dragons can climb trees and swim long distances. Occasionally males will swim from island to island in pursuit of food. They come out to feed in the morning and hunt along game trails, where they wait for prey to pass. A kill is usually shared by many Komodo dragons and very little is wasted. One researcher reported that a 100-pound dragon once consumed a 90-pound pig in just 20 minutes. 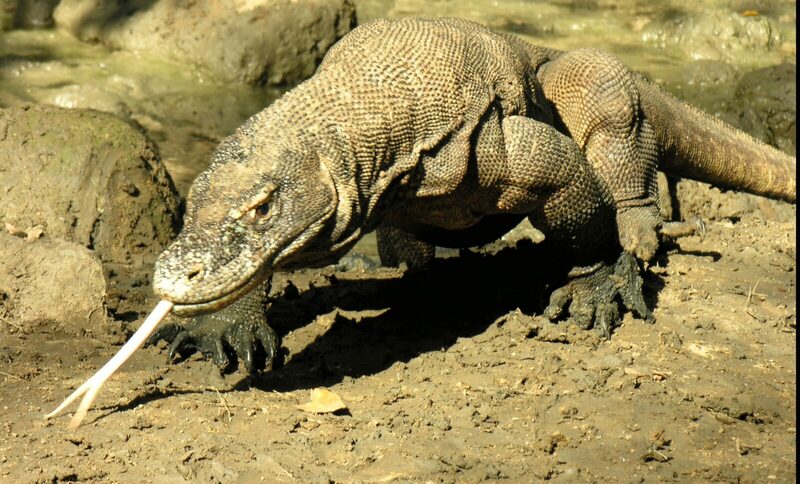 The world of the Komodo dragon is restricted to the Lesser Sunda Islands of Rinca, Komodo, Flores and the smaller islands of Gili Montang and Padar. The natural habitat of the dragon is extremely harsh by human standards. These arid, volcanic islands have steep slopes and little fresh water most of the year. Dragons are most abundant in the lower forests and savannas. They are an endangered species because they have such a small habitat in just one region of the world. An ecological disaster in this area, such as a major volcanic eruption, could push them into extinction. Since Komodo dragons are cold-blooded animals, they preserve their energy to maintain body temperature. In the morning, adults emerge from their burrow to greet the sun and its warmth. After warming themselves in the morning, they begin searching for food. Their hunting expeditions are usually followed by a nap in the shade during the hottest part of the day. They usually hunt again during the late afternoon before burrowing itself away again during the cool hours of the night. Komodo dragons are solitary animals, except during the breeding season. There are four times as many male dragons as females, so mating season is competitive. Males maintain and defend a territory and patrol up to two kilometers per day. Territories are dependent on the size of the dragon. Dominant males engage in ritual combat in their quest for females. Using their tails for support, they stand on their hind legs and wrestle in upright postures, grabbing each other with their forelegs as they attempt to throw their opponent to the ground. Blood is usually drawn, and the loser either runs or lays motionless. The victor then rakes his claws in slow, long strokes down the length of the loser’s body to demonstrate his superiority, while the loser must endure this humiliating act until the victor is satisfied. The female dragon lays about 30 eggs in September. She lays her eggs in holes dug on hillsides or within nests built by megapodes, birds which build heaps of earth and twigs for nesting. The Komodo dragon often prefers to take these nests from the megapodes rather than digging them from scratch. While the eggs incubate for about seven months, females may lie on the nests to protect them. However, no evidence exists for parental care of newly hatched dragons. Hatchlings are about 40 centimeters long and weigh 100 grams. They eat insects, live in trees, and must fend for themselves from the moment they are hatched. While some females can breed in consecutive years, many do not. It takes some females more than a year to save up enough energy to reproduce again. Some females return to the same nest sites over and over again. Dragons may live about 30 years in the wild, but scientists are still conducting research on this aspect of their lives. The largest threat to the survival of individuals and the species is volcanic activity, fire, and subsequent loss of its prey base. Currently, habitat alteration, poaching of prey species and tourism may have the most pronounced effect. Commercial trade in dragon specimens or skins is illegal under the Convention on International Trade in Endangered species. However, dragons have been hunted over the years, but not to the extent of decimating the population. The creation of Komodo National Park in 1980 and strict anti-poaching laws have helped protect them. Unfortunately, villagers have been known to use poisoned food to reduce the dragon population, much like ranchers of the American West poison sheep carcasses to rid the area of coyotes, wolves, and mountain lions. Additional studies are in progress today by the San Diego Zoo and the University of San Diego. In 2003, this research began establishing a broad scale and comprehensive tracking program to increase the understanding of these giant lizards. Approximately 400 dragons were caught, measured, and inserted with transponder tags. These tags will provide a means for identification of each individual dragon over its lifespan, which will enable scientists to gather basic information for conserving and managing this species. In 1992, Komodo dragons hatched for the first time outside of Indonesia at the National Zoo in Washington, DC. These offspring have been sent to more than 30 zoos around the world. The one-horned Javan rhinoceros is only found in Ujung Kulon National Park in West Java. As late as the 1880s, thousands of these animals roamed all over the island of Java. Then the colonial Dutch government put a bounty on them to rid the island of these pests. In just 40 years, the rhino faced extinction on Java. The Dutch then created the Ujung Kulon Wildlife Reserve in 1921 on the southwestern tip of the island to give the remaining animals a chance to survive. The reserve became a national park in 1981. This animal is extremely rare, with just 40-50 animals remaining in the wild. Despite their size, Javan rhinos move quickly and quietly through tangles of vines and thick walls of jungle shrubs. By lowering their heads, the animals move like huge wedges that push the undergrowth up and over their backs as they plow through the thick vegetation. In 1990, the World Wildlife Fund pioneered what has become a common photo-trapping technique in Ujung Kulon National Park to determine how many of these animals remained in the wild. They set up several hidden cameras along rhino trails. Each camera was set to automatically trigger when an animal approached and stepped on a pressure-sensitive mat that was hidden under a thin layer of dirt on the trail. When an animal stepped on the mat, its weight triggered the camera to take its picture. After 576 rolls of film and 20,000 snapshots, they had a good census of all the animals living in Ujung Kulon, including black and spotted leopards, wild dogs, wild buffalo, deer, and peacocks. They also got many shots of the rhinos. After studying the physical markings of all the rhinos in the photos, including scars, horns, height, and other unique attributes, the scientists determined that there were about 46 of these rhinos still alive in Ujung Kulon at that point in time. It is not known if that number has gone up or down since the census. The forests of Sumatra also support the increasingly rare Sumatran rhinoceros, the smaller cousin to the Javan rhino. As with many other species around the world, it is threatened by loss of its natural habitat. Poaching also threatens its existence. Tracks have been seen in the swamps of Kalimantan, which indicate that a few of these creatures also may still be alive on the island of Borneo. The sun bear is the world’s smallest bear. It inhabits the forests of Borneo and Sumatra, where it is feared despite its small size. This bear is very near-sighted, which allows it to be easily surprised by people in the forests. When surprised, it will turn on an intruder with its vicious claws. Wild pigs are found throughout Indonesia. The warty pig common around teak plantations on Java and it is hunted for sport in those areas. The babirusa pig of Sulawesi resembles a wild boar and has large tusks that grow through its cheeks. Bats of all types are common throughout the country with 90 species in Kalimantan alone. They vary from large flying foxes and fruit bats to tiny insect-eating bats. The limestone caves of the region host thousands of bats, which emerge at dusk and return at dawn every day. Most of Indonesia’s snakes are harmless and all are shy with the exception of the death adder of Papua and Maluku, which is both aggressive and very poisonous. Sea snakes, cobras, and tiny kraits also are deadly. Crocodiles are found mostly in Papua and Kalimantan. The demand for their skins for handbags and shoes has led to extensive hunting. Indonesia is home to 17 percent of the world’s known bird species. There also are more endangered bird species here than anywhere else on earth. Sumatra and Kalimantan alone have some 450 species of birds. There are more than 300 bird species on Bali and Java. In Maluku, signs start to appear of the influence of Australian birds, most noticeably the parrots and cockatoos. There are more than 40 parrot species and more than 20 species of the bird of paradise. Only a few of the latter have the gorgeous plumage, which makes them prized for decoration by the natives of Papua and for export. Relatives of the birds of paradise are the bowerbirds, which build intricate woven nests to attract a mate. The male bowerbird builds a cone-shaped nest more than one meter tall. It also builds a door and a front terrace that are then decorated with flowers and fruit. The hornbill is a cornerstone of the arts and culture of the Dayak tribes of Kalimantan. The rhinoceros hornbill in particular is the dominant image of the area. Indonesia’s 17,500 islands compose the largest and most varied archipelago on earth and span more than 3,100 miles from Asia to Australia. The country is more than 80 percent water, which includes more than 80,000 kilometers of coastline—equal to nearly one-third of the earth’s circumference. This vast coastline offers more coral reefs than any other place in the world. 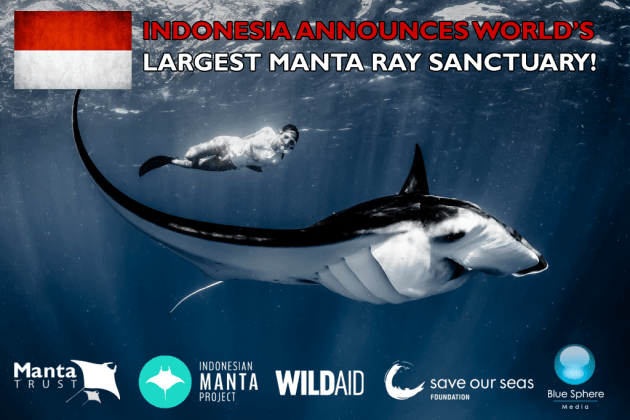 The central area, the waters around the Indonesian and Philippine Islands, is the least known of the region’s oceans and much more scientific work must be done. In tropical waters, where the temperature and salinity are right, corals have blossomed into massive gardens, with an amazing variety of forms and colors. 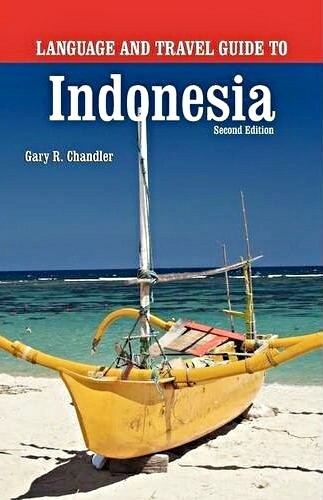 The seas surrounding the Indonesian archipelago are considered an integral part of the nation, as evidenced in the country’s patriotic phrase Tanah Air Kita, which literally means our “home, water, and land.” The seas have been a unifying force between the diverse cultures and peoples throughout the archipelago, since many Indonesians are dependent on the bounty of the seas. Fish, shellfish, pearls, seaweed, and shells are only a few of the treasurers found in Indonesia’s vast waters. Indonesia has more coral reefs than any other place on earth. They are fed by rich nutrients in the ocean currents. These islands hold about 10 to 15 percent of the world’s coral reefs, many of which are still unknown. There are more than 500 species of coral throughout these islands, including some of the most colorful species on the planet. These waters are home to 3,000 species of fish and 30 species of whales and dolphins. The Sulawesi Sea is the equivalent of a highway for sperm whales, dolphins, and other large marine life, such as sea turtles and manta rays. There are more species of fish, coral, and other marine life found in Indonesian waters than in any other country. Indonesia has an astounding array of marine life and some of the most spectacular diving in the world. Unfortunately, it is disappearing fast, due to human activity, including fishing with dynamite and cyanide. 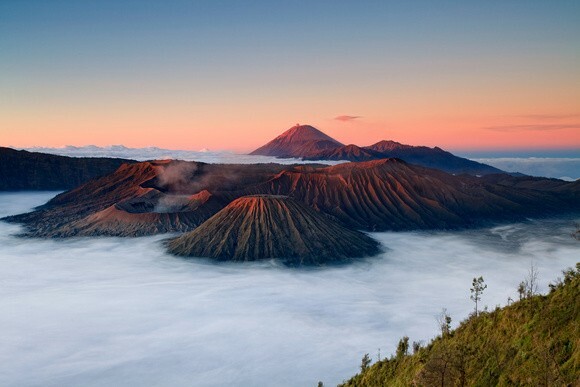 Bromo-Tengger and Semeru, East Java. The floor of the Tengger caldera is a vast sand sea, 10 kilometers across. Cones of the active Bromo volcano and others rise from the sand sea. There are three lakes and a small rest house at Mt. Semeru, the highest volcano in Java. Though under PHPA jurisdiction, no special permit is presently required for a visit to this reserve. The total area covers millions of acres and reaches nearly 12,000 feet above sea level. Most travelers reach the area from the north by road from Pasuruan to either Tosari or Ngadisari. Both villages are just below the rim of the Tengger crater and offer some accommodation as well as horses and guides. There also is a small hotel at Cemara Lawang above Ngadisari. Meru Betiri, Java. Coffee plantations occupy much of the lowland and thick forests, while the steeper parts include precipitous highlands. Two species of the parasitic rafflesia flower are found in Meru Betiri, which was the last refuge for the extinct Java tiger. The reserve starts at sea level and reaches about 4,000 feet high. Ujung Kulon and Krakatau, Java. The mainland reserve area is the last refuge for the 45-50 remaining Javan rhinos, and essentially is the last lowland rainforest in Java. Other wildlife species found here include gibbons, macaques, leaf monkeys, deer, pigs, wild ox, and more than 200 species of birds. Ujung Kulon has beautiful beaches, seascapes, and coral. The Krakatau volcano, 40 kilometers from Labuan, is accessible from here on a day trip. Although the original Krakatau erupted violently more than a century ago, it has been regenerating itself ever since and frequent and violent eruptions are common. Kutai, East Kalimantan. In spite of timber exploitation and the logging roads, this reserve still contains large areas of lowland rainforests. Boat trips with side excursions by foot offer chances to see some of the last remaining hardwood forests in East Kalimantan. The reserve covers 200,000 hectares and has a maximum altitude of just 340 meters, so don’t expect to find any cool highlands here. Tanjung Puting, Kalimantan. If you hope to see orangutans in the jungle, this is your best opportunity. This trip requires an interesting boat ride through swamp forests that are full of life. The boat trip itself offers abundant opportunities to see the proboscis monkeys, so-called because of the male’s large nose. These and other creatures sit in the trees along the river in the mornings and evenings watching the boats on the river. Camp Leakey is located inside the park and serves as a rehabilitation station and study site for orangutans. Visitors can walk freely and experience close encounters with these fascinating creatures. For more than three decades Dr. Biruté Galdikas has studied and worked closely with the orangutans of Indonesian Borneo. She works with them in the jungle where they are free to come and go as they please. Galdikas is the world’s foremost authority on the orangutan. She conducts a great deal of her research in and near Tanjung Puting. When her family moved from Lithuania to the United States in 1964, Galdikas began her studies of natural sciences at the University of California at Los Angeles (UCLA). It was there as a graduate student that she first met anthropologist Dr. Louis Leakey and spoke with him about her desire to study orangutans. After three years, Dr. Leakey finally found the funding for Galdikas’ orangutan studies, as he had previously done with both Jane Goodall and Dian Fossey for their studies on chimpanzees and mountain gorillas. In 1971, Galdikas arrived in Indonesian Borneo. There were no telephones, roads, electricity, television, or regular mail service there at that time. By the year’s end, she had set up “Camp Leakey,” named after her benefactor. She began documenting the ecology and behavior of the wild great apes. 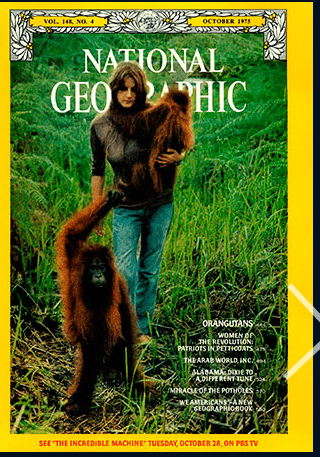 Four years later, she wrote the cover article for National Geographic magazine, bringing the orangutan widespread international public attention for the first time. Today, the situation facing wild orangutans is far more complicated than when Dr. Galdikas first began her studies. As a result of poaching and habitat destruction, orangutan populations are on the edge of extinction and could be gone within the next five to 10 years. Galdikas has studied orangutans longer than any other person in human history. She has worked to save orangutans and forests, while bringing orangutans and their plight to the attention of the world. Tongkoko, North Sulawesi. This area features beautiful volcanic scenery and wildlife, including macaques, tarsiers, pygmy squirrels, and hornbills. Megapode birds lay their eggs in the areas of volcanically heated sands. There are two small guard posts within the reserve that offer basic shelter, food, and camping equipment. Lore Lindu, Sulawesi. The reserve includes lowland and mountain forests, many streams, much wildlife, especially the anoa (dwarf buffalo), babi rusa, and black macaques. Interesting megaliths are found in the valleys. The altitude ranges up to 6,000 feet. There are no formal tourist facilities, but accommodations are available in the villages of the Western Toraja people, who travel the paths in and out of their isolated valleys to trade. Gunung Leuser, Sumatra. Two research stations within the reserve provide orangutan rehabilitation services, which can provide visitors with a rare opportunity to see these magnificent apes up close. A boat trip on the Alas River, which flows through the reserve, is a good way to see the rainforest habitat of endangered species such as rhinos, orangutans, tigers and elephants. There also are gibbons, leaf monkeys, jungle cats, forest deer, otters, hornbills and argus pheasants. The serown is a goat antelope, which lives in the mountain forests at higher altitude. Gunung Leuser reserve can be reached by road from Medan, North Sumatra. Penanjung Pangandaran, Sumatra. This reserve includes beaches, coral gardens, caves, and nature walks. This area also is good for bird lovers. There are nice forests in the lowlands and in the mountains at the northern end of the reserve. Wildlife viewing can include gibbons, elephants, tapirs, pigs, deer, and an occasional tiger. The Bogor Botanic Gardens, West Java. This is the most renowned of Indonesia’s public gardens. It has won international acclaim for its elegance and diversity. It was initially planned and designed at the orders of the British Lieutenant Governor Sir Thomas Stamford Raffles with the help of experts from the Kew Gardens. The Bogor Botanic Gardens opened in 1817, at the end of the British occupation. It has a collection of more than 15,000 native and foreign plant species, including orchids and the giant Rafflesia, which blooms only once a year. Bogor is about 40 miles south of Jakarta. The Cibodas Mountain Garden, West Java. This garden was founded in 1862 for the study of mountain flora and fauna. It’s located at an elevation of almost 4,000 feet on the slope of the Gede volcano. Attached to this garden is a forest reserve extending up to the summit of Mt. Pangrango and the crater of Mt. Gede. The Cibodas collection includes imported plants and flowers from several tropical countries. Orchid Gardens, West Java. Commercial orchid gardens are found in Jakarta at Slipi and in the Taman Mini Indonesia Park. These gardens produce numerous exotic orchid species, including the black orchid, which grows naturally in the Kersik Luway reserve of East Kalimantan. The Purwodadi Garden, East Java. This garden was founded in 1914 for the study of plants growing under relatively dry and high-altitude conditions. It is located on the lower slopes of Mount Arjuna. As you may have noticed, the best gardens are often found on the fertile slopes of volcanoes. The Eka Karya Garden, Bali. This garden was founded in 1959 for the study of the mountain flora of the West Nusa Tenggara region of Indonesia. It’s located at Candi Kuning on the slopes of Mount Pohen on Bali. Three tracts of nature reserves are adjacent to the garden.